Selfies are killing more people than shark attacks. 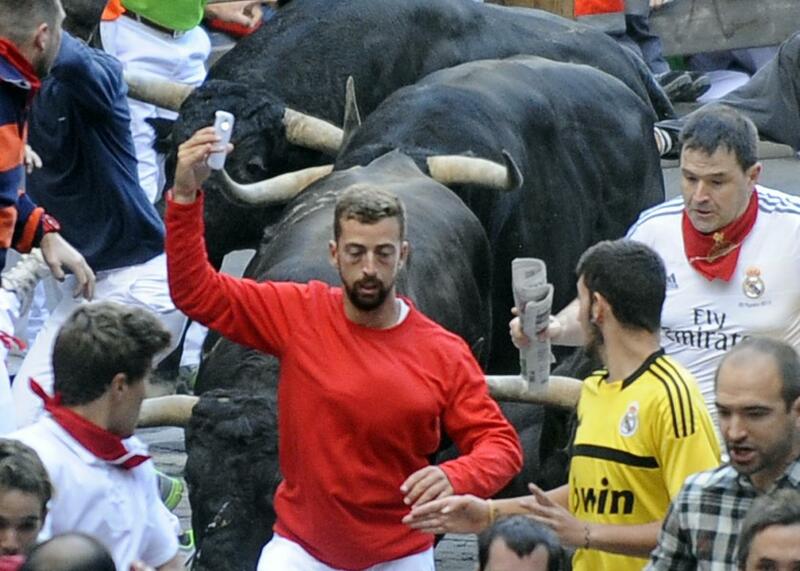 A particularly dangerous selfie at Pamplona’s running of the bulls in 2014. Last week a 66-year-old Japanese man traveling in India fell down a staircase while attempting to take a selfie and died. It’s increasingly obvious that people choose bad moments to take selfies, so now the conversation is turning to comparisons. And apparently selfies have become more dangerous than a lot of already scary-sounding things. In August a man trying to take a selfie was gored to death during a running of the bulls in Villaseca de la Sagra, Spain. And there have been numerous bison attacks following attempted selfies in Yellowstone National Park. Some groups have been trying to get on top of the wave. In June Disney banned selfie sticks in its amusement parks. And foreseeing the selfie crisis in a very specific way, New York State passed a bill in June 2014 to prohibit people from having their photo taken (or taking it themselves) while “hugging, patting or otherwise touching tigers.” There was already a snake selfie-related injury in 2015. “We’ve actually seen people using selfie sticks to try and get as close to the bears as possible, sometimes within 10 feet of wild bears. … The current situation is not conducive for the safety of our visitors or the well-being of the wildlife,” Denver Water’s manager of recreation, Brandon Ransom, said earlier this month about bears at the Waterton Canyon hiking area. Given the classic advice “never turn your back on the ocean,” you’d think it would go without saying that that applies to a bunch of other dangerous things, too. But apparently not!